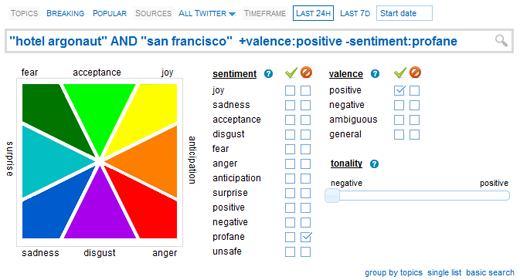 Check out our new Advanced Opinion Search parameters “sentiment”, “valence”, and “from”/”to”. On Opinion River (formerly News River) click on “advanced search”. Here you have a choice of 8 sentiment dimensions such as “joy”, “sadness”, or “surprise”, two quality dimensions “positive” and “negative”, and two profanity filter dimensions “profane” and “unsafe”. We are using Plutchik’s color wheel in case you were wondering about the sentiment colors. The Sentiment Color Map and the Sentiment selection checkboxes are coordinated. When you click on a sentiment area in the map, the appropriate checkbox is selected too, and vice versa. The “valence” search parameter represents the aggregate emotional orientation of a text fragment. Use the valence parameters if you don’t want to specify the individual sentiment dimensions. Use the plus and minus signs if you want to include or exclude a sentiment dimension or valence (e.g. “+sentiment:joy -valence:negative”). You can use multiple inclusion and exclusion terms for sentiment dimensions and valences (e.g. “+sentiment:joy +sentiment:surprise”).